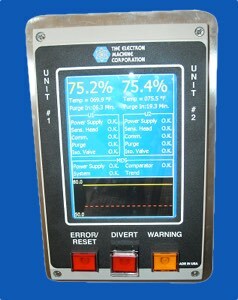 An essential system for the safe operation of black liquor recovery boilers, the MDS E-Scan Monitor Divert System is designed for BLRBAC compliant “fail-safe” operation. Electron Machine Corporation’s RSP Remote Status Panel is a valuable tool to complement this system. Providing both Operators and Technicians key information for the real-time status of all vital parameters in the convenience of the control room. The RSP ultimately provides for safer black liquor firing, a reduction in un-necessary diversions, and faster diagnosis when a problem occurs. 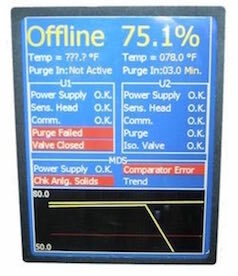 During normal operation, the RSP Remote Status Panel intuitively displays the Black Liquor measurement and temperature information of both refractometers along with their purging information and a 2-hour trend graph. Status indications of monitoring functions are logically displayed. When a problem occurs, attention is established by immediately illuminating error and/or warning lights. The upsetting parameter information is displayed within the associated status box for fast problem diagnosis. Once the problem is corrected, a remote reset of the MDS system can be performed directly from the RSP Remote Status Panel. Providing Operators with additional status information allows problems to be recognized, diagnosed, and corrected in a timely manner. Communication with Technicians is improved for faster repairs and the risk of compound problems leading to an unnecessary diversion is reduced. The recognition of impending issues or abnormal parameters can be used for decision-making purposes ultimately providing for safer firing of black liquor.